Pegasus Automation, along with their sister companies Pegasus Property and LLI Design, sit in a special position in the Custom Install marketplace; the unique vertical integration between the three companies allows them to deliver great design, clever integration and a high quality, professional finish whilst maintaining a single point of contact for their customers from start to finish. By working closely with Future Automation on numerous projects, Pegasus Automation have been able to offer their clients great home automation solutions, that are seamlessly integrated into the customers' homes. Sam Lee, Director at Pegasus Automation, described Future Automation's products as "logically engineered with installation in mind; both on the physical install side as well as with integration with third party control systems." It is this logic engineering and key attention to detail that allows Future Automation to provide the best quality, and durable products for our dealers and clients. Again, speaking from their offices in Highgate, London, Sam at Pegasus Automation said "Future Automation's products allow us to have the best of both worlds: being able to deliver an aesthetically layered balanced space, while still featuring all the modern home technology that a customer requests." 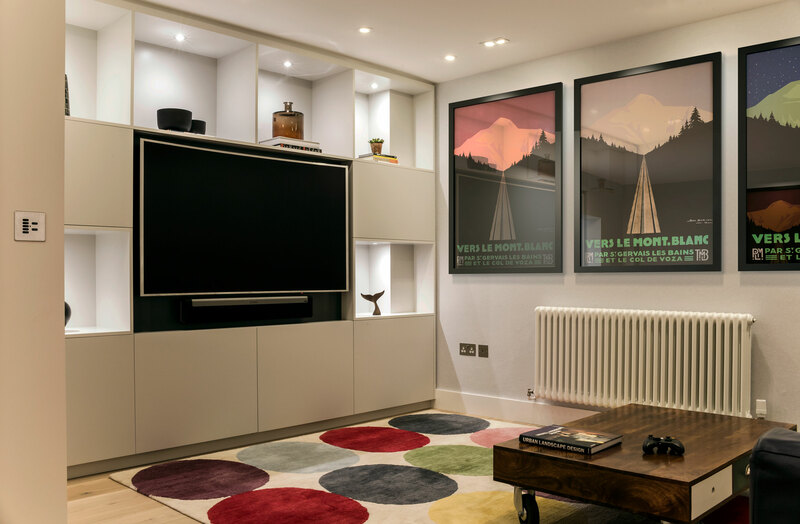 One of Pegasus Property's stand out projects was a full redesign and renovation of a high end, 4 story 1970's town house in Highgate - This project featured a number of Future Automation products, including our PIC Picture Lift Mechanism and our V74 Ultra Flush Wall Brackets. Both of which can be viewed and purchased on our website. The team at Pegasus Automation chose to invert the PIC Picture Lift Mechanism, enabling them to recess a large screen higher up on the wall for a better viewing position through the dining/ living room. Design Director Linda Levene at LLI Design said "Being able to reveal a 65" screen from behind a panel or piece of art work at the touch of a button, without the screen dominating the room when not in use is ground breaking. The products we are installing from Future Automation aren't just well designed but also extremely well made and dependable." The quality of the work stood out so much that this particular project was awarded Best Interior Private Residence London, in the United Kingdom Property Awards 2016. Other projects also featured intelligent lighting, under floor heating and distributed audio throughout the via plaster in speaker and sub woofers. On another recent project, LLI Design and Pegasus Automation utilised the Future Automation PS Bracket Range in a newly built detached home in London. The owners of the house wanted to achieve a modern look that wasn't cold and clinical but somewhere they could relax and entertaining, whilst functioning as a practical family home. The challenge here wasn't hiding the technology, but instead integrating it seamlessly with clean lines of the room. Using our PS55 Manual Pull and Turn bracket, Pegasus Automation mounted 65" TV to sit flush against the bespoke stud work with a perfectly even shadow gap and no wires on view around or under the screen. 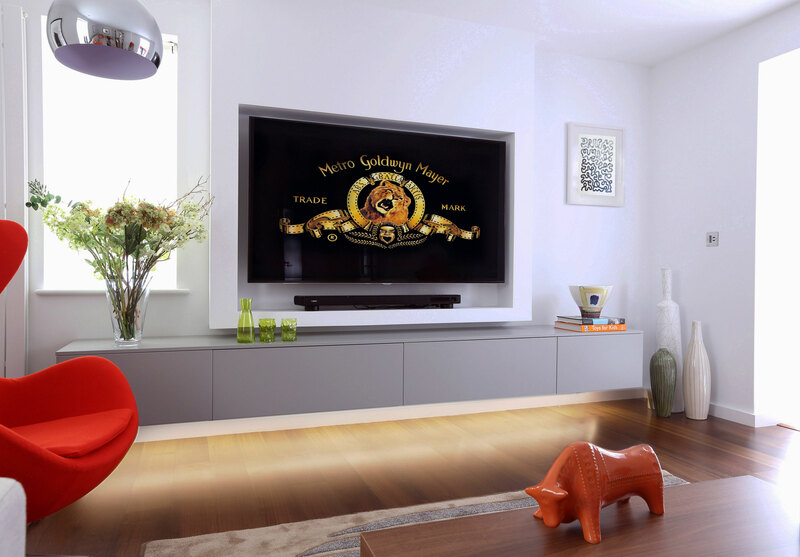 The PS55 bracket allowed an easy installation of the screen, as well as the option for the customer to move the screen out and around for multiple viewing angles in order to achieve the best viewing experience. The director at Pegasus Automation further praised Future Automation by saying; "we specify Future Automation products where ever possible as we known their quality is consistent across the product ranges, even if we haven't used a particular product before we know in advance what to expect in terms of build design quality." Pegasus Automation again worked work their sister company, LLI Design on another Highgate project. This time the brief was to redesign and refurbish a seven-story townhouse in a contemporary style, without losing the family feel. Throughout this project, Pegasus Automation configured and installed a whole house music distribution system seven different zones, playing through in-ceiling speakers inside, and outdoor speakers in the garden and terrace. Pegasus Automation again chose to use our V74 Ultra Flush Wall Bracket in this project, along with the USM Universal Speaker Mount to mount a 55" screen and SONOS playbar. The low profile of the V74 allows Pegasus to integrate the screen and sound bar in a bespoke fitted storage unit in the home's "TV den". The team at Pegasus Automation said working with Future Automation on all the projects to be "Very straightforward, with the technical specs and drawings being easily accessible" which makes the process effortless and professional from both the dealers and the clients perspective. Here at Future Automation, we are looking forward to working with Sam and the team at Pegasus Automation in the future and can't wait to see more unique ways they come up with to use our products! Pegasus Automation are an approved Future Automation dealer based in London, UK. They design, install, configure and maintain a wide range of home automation systems for private clients and developers. Pegasus Automation can be contacted via www.PegasusAutomation.co.uk or on +44 (0)208 050 1745.